Move sliders to set speed and following distance. Ticketed for Following Too Closely in Oklahoma? This following distance simulator calculates distance between vehicles at specified speeds and separation. Wirth Law Office prepared this simulator after the Oklahoma Court of Criminal Appeals ruled that police can stop drivers for following less than two seconds or even three seconds behind the next vehicle. Oklahoma law does not establish a two second rule or a three second rule for safe following distance. The three second rule referenced in Oklahoma v Zungali, 2015 OK CR8 comes from Oklahoma Dept. of Public Safety’s manual for Oklahoma drivers. We might agree that leaving generous following distance can sometimes be a preferred defensive driving tactic, but Oklahoma law for following too closely does not establish a specific minimum distance drivers must maintain between vehicles. Case law that references the two second rule or three second rule seldom has anything to do with traffic safety. The case law primarily involves drug cases where police have claimed to suspect following distance violations as the basis of traffic stops, which led to drug busts. 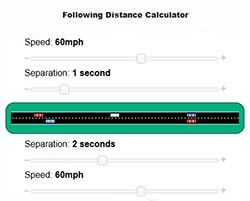 The two second rule calculator on this page provides a visual reference to help you determine what is a typical following distance you see in daily traffic. The following distance calculator provides a way for you estimate a two second or three second following distance for your own driving, if you choose to maintain those following distances. Our publication of a two second rule calculator is not intended to suggest the two second rule or a three second rule is part of Oklahoma traffic law. If you have been cited for following too closely in Oklahoma, contact a Tulsa traffic ticket attorney at Wirth Law Office for a free consultation about your options. If you are charged with another offense and police used following too closely as probable cause to conduct a traffic stop, I also encourage you to contact a Wirth Law Office criminal defense attorney for a no-cost consultation about your options. For a free consultation, call Wirth Law Office at (918) 879-1681 or send your question using the email form at the top of the page.